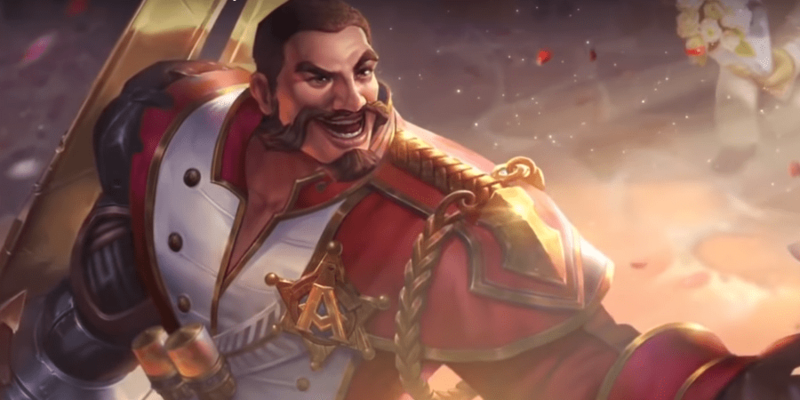 Several items and builds that can be used when playing Arena of Valor's Rourke, the Captain. We have provided a number of options for varying playstyles, allowing players to make builds that fit their personal play styles. These items are necessary in order to play Rourke optimally. Only diverge from a core item if you are a very experienced player or you have a very good reason for doing so. Frost Cape Both items work very well on The Captain, giving him some juicy CDR on top of other very useful stats. Both passives work wonderfully with Charged Shot (here’s where we remind you not to take both, as you’ll lose Frost Cape’s passive), Omni adding another 1.0 AD to its already considerable damage and Frost slowing the opponent so you can catch up and finish the kill. The Beast While its lack of a passive makes it a bit lackluster to most, Rourke can find a lot of use out of The Beast. His burst damage attack style and reliance on normal attacks allow him large amounts of health regeneration in the middle of fights. When in a pinch, he can use Determination to cover his health and gain some time to freely regenerate. Spear of Longinus While Rourke already has a built in armor shred, Spear of Longinus can stack with it to completely rip away enemy defenses. In addition to its fine passive, the item offers large amounts of cooldown reduction, attack damage, and health, all of which very useful stats for the Captain. Scorching Wind Rourke can excel in the jungle and so will often be picking up a jungling item. Scorching Wind is the most obvious choice, it doing the most to enhance his damage. The ability to quickly lob out shots will additionally help the sailor keep his shield up while using Determination. Players looking to play more like a tank could take Leviathan instead. Medallion of Troy While almost purely defensive, Medallion of Troy offers its wielder a number of valuable stats while giving them some coverage against magic users. Rourke’s kit has durability against physical damage built into the abilities, but he needs a bit of support in order to survive magical damage. Muramasa The armor pierce from Scattershot and Spear of Longinus not enough? Cut through the rest with Muramasa. While not offering much late game against squishier foes, Muramasa will allow Rourke to bust up tanks unfortunate enough to get caught by him. The additional cooldown speed that it provides is a nice boost as well, allowing the Captain use his abilities more frequently. Rankbreaker Similar to Muramasa, Rankbreaker is for when wanting to further the armor pierce of scatter shot and Spear of Longinus. While less effective at tearing down tanks, adding Rankbreaker to his build will allow Rourke to deal close to true damage to squishier foes. This item is especially useful when he’s jungling, the movement speed it offers a help in moving between lanes. Fenrir’s Tooth Fenrir’s Tooth finishes off builds by greatly amplifying the wielder’s finishing potential. It offers large amounts of attack damage along with a passive that further boosts damage to low health targets. Rourke’s burst damage kit can make good use of this item, helping him knock down enemies before they have a chance to escape. War Boots War Boots is a good offensive choice, allowing Rourke to dish out his bursts of damage more frequently. His kit is naturally durable, making defensive options less necessary. Gilded Greaves Rourke will have a very bad time when not able to properly position himself. Gilded Greaves helps him out here, helping him shrug off any control effects the enemy might be using to slow him down. This build puts Rourke in the jungle and gives him both attack speed and power in order to maximize his damaging potential. As he already is fairly tanky with his ultimate, we simply rely on the defensive stats provided by Spear of Longinus and Medallion of Troy to keep him healthy in fights. Between Scorching Wind, Omni Arms, and Muramasa, his abilities will be landing for fantastic amounts of damage, making the Captain extremely lethal. This build takes a much more defensive approach to Rourke. It relies on his natural damage to burst down enemies, he instead taking the role of a bruiser for his team. Each item provides some sort of defensive bonus, giving the sailor a lot when it comes to absorbing enemy fire. He won’t be a complete slouch when it comes to damage either, Frost Cape, and Odin’s Will amplifying his damage along with their defensive boosts. Here we put Rourke in the dark slayer lane. While marksmen are generally more suited to the Abyssal Dragon lane, Rourke’s durability and dueling potential make him excellent for the position. We focus more on damage here, building him rather aggressively. Rather than a jungle item, however, we take Fafnir’s Talon for the attack speed, damage, and lifesteal it provides. The passive is a nice bonus as well. Brian Tsai’s Party in the House Tonight, Boys! A true warrior build for Rourke. Massive sustain from Leviathan and The Beast, Omni Arms wrecks with 1st Ability, attack speed from War Boots, 20% CDR, 40% with Blue Buff. Brian Tsai makes a jungle warrior here by giving Rourke a lot of sustain and survivability without sacrifice much damage. The warrior will be able to duke it out with the big boys while still able to rip enemy carries to ribbons. My Rourke build is Soul Reaver, War Boots, The Beast, Omni Arms, Muramasa, Blade of Eternity. The last Item is changeable in which I’d pick Fenrir’s Tooth or Death Sickle. There is a slight typo in your Defensive Build, as near the end it mentions Spear of Longinus even though the item isn’t in the build, unless I’m mistaken and it’s just referring to the item in general. The build Provides just the sufficient Dmg the Captain should do while being in the fight for Long. Will work almost like a Butterfly with Massive Survivability. Should I use devil’s handshake when laning? I personally don’t care for it so much, however, it can be useful to Rourke, especially if used as your only attack speed item. It alone can help Rourke add stacks of his passive quickly to opponents and ensure that Determination stays up. I prefer stacking attack damage or other attack speed items like Fafnir’s Talon or Blitz Blade as they offer damage as well, but Devil’s Handshake can be good if taken alongside other items with higher base damage but no attack speed offerings like The Beast or Fenrir’s Tooth. That’s more of an assassin-like approach for Rourke. Basically without his ult, he ain’t lasting in team fights. He needs to get close to do Max damage, and he need the health to sustain. My Rourke build is Leviathan, Flashy Boots, Omni Arms, Fafnir’s Talon, Medallion of Troy, Fenrir’s Tooth. Health early game; gets stronger as the game progresses; armor from Leviathan; armor pierce from passive; 30% CDR. Leviathan, War Boots, Omni Arms, The Beast, Medallion of Troy, Fenrir’s Tooth. Yes. I personally prefer Scorching Wind to start with so that he can get out stacks of his passive faster, but extra attack damage will always be a big plus.